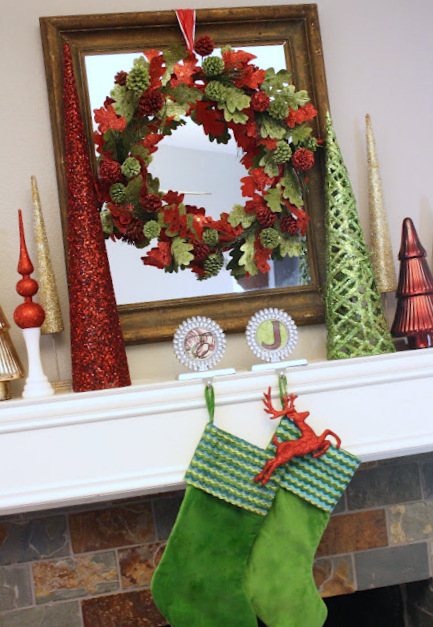 Let me start with a confession: I am sorta kinda (really) running out of Christmas mantels ideas to show you. I do believe every scrap of Christmas cheer I own has made it's way onto my mantel. And, the cheer is running out. That's right, you've seen it all. Confessions, revisted: This was the exact mantel I put up last year. As in, let me consult a photograph so I can remember precisely what it looked like. This year I kind of wanted to phase out the green and go with red and metallics. But, then I decided I wanted to phase out the glitter and go with a modern lodge theme. But, then I scrapped that idea and decided to go with a lovely aqua, red and white theme. Are you kind of seeing my great problem here?? I simply can't make decisions. So, what did I end up with? Oh, just a little bit of everything. And, that, my friends, sums up my style perfectly. I like to call it Indecisive Chic. Uh-oh. Now you know I don't have a stocking up for my daughter yet. I just can't seem to decide which one to get her! Oh my, I just realized my indecision has kept my daughter from getting her first stocking. Okay, I'm on it this week. I promise. Hmm...I'm actually kind of enjoying the green. Maybe I won't phase it out, after all. Which Mantel Monday Christmas mantel is your favorite?? It's an oldie, but a goodie. I love it! I need to get myself a mantle so I can start decorating it with all these ideas I have now that I've found you're blog. Simply lovely, Emily. Which design will you use on Christmas Eve? How will you decide??! Love it ~ Have to pin it!!! Hard to pic a favorite, they're all incredible! You definitely have a talent girl! PS The Linky Party is OPEN! Thanks Emily! My place is looking even prettier now that I have your pretties on there to admire!! Thanks ladies!! You guys are the best! I have not seen it before and it is splendid. It looks great! 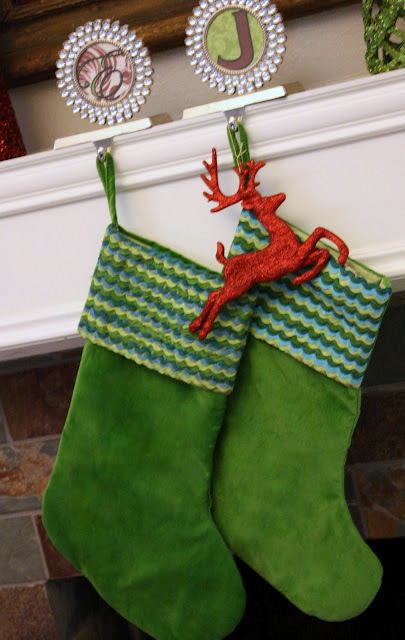 I love your stocking holders! Your mantel is lovely! I'd love for you to come by and link up at my Friday Favorites party! 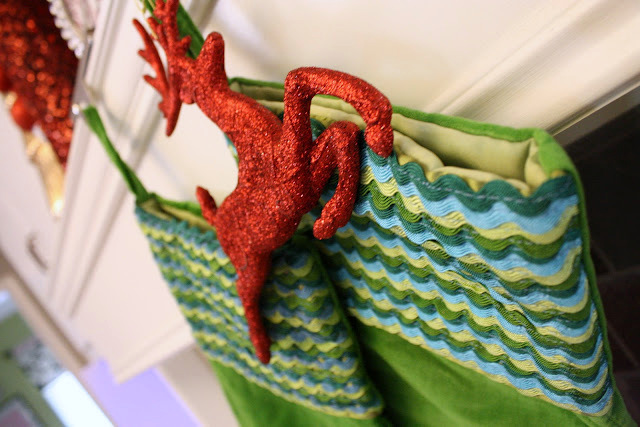 Today is a special Holly Bloggy Christmas edition! 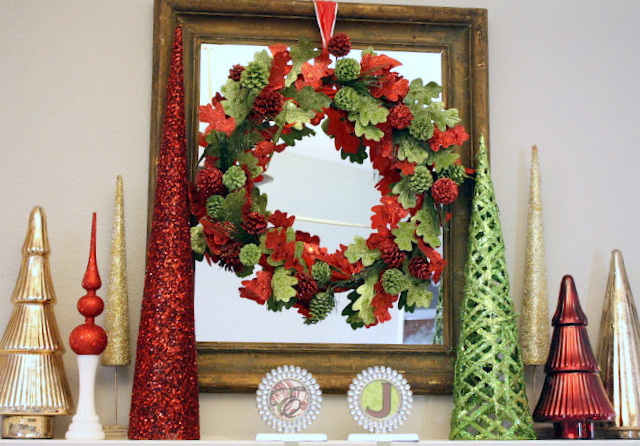 Even if you did rip off your own last year's mantel, it's still fabulous! I'd love it if you'd stop by and share your Christmas tree at the Blogging around the CHRISTMAS TREE linky party going on right now at my place! Oh my goodness! I had two windows open and didn't realize I had switched to yours when I was checking out your lovely mantels. Gorgeous as always! Thanks so much for linking up and sharing at my Feature Friday Linky Party! Hi! Thankds for stopping by for a visit...and now here I am! I probably would not have found you otherwise...and I am so glad I did! The last mantle is my favorite. I love all the of the trees in the traditional colors...and the wreath on the mirror...the stockings...even the red reindeer. I love it all! 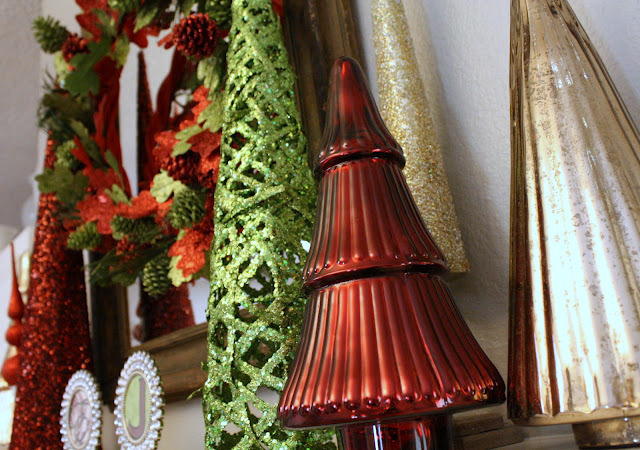 I have such a hard time with my mantel all year round! I never can get it right! It is really two tall for the room...quite wide...and not very deep...so I feel like I have short squatty things lined up with no dimension. My point...I will be checking out your mantels...I am in desperate need for some ideas! oh...and I am you latest follower! to remain your jewelry effort your struggle select. volition assistance control that your are willing to avail willingyou get started.